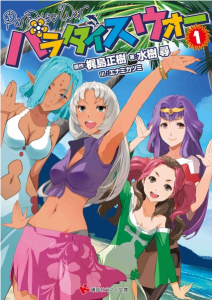 Paradise War is the latest canon spinoff in the Tenchi Muyo! Ryo-ohki universe from creator KAJISHIMA Masaki. At present (March 31, 2015), Paradise War consists of three novels, the last published May 30, 2014. Whether more are planned or not remains to be seen. Kajishima-sensei is still writing the GXP novels, his doujinshi, and is trying to get another anime series going. 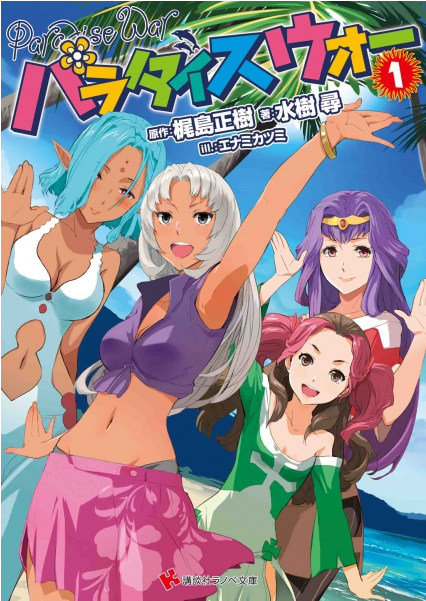 When does Paradise War take place in the Tenchi Muyo! Ryo-ohki canon timeline? The exact time frame that Paradise War takes place in has not been revealed. However, it does take place several years after the events of Tenchi Muyo! GXP. What is Paradise War about? Who are the central characters in Paradise War? KUKOMA Shou: He’s a young teen (unknown age at present) who comes to Banjo Island for paradise and ends up in a survivalist lifestyle, aided by several young women he meets. Dird Shank: She is the representative from the Shank Guild and currently 1882nd in line for the guild’s successorship. Alea Balta: She is the representative from the Balta guild and currently 23200th in line for the guild’s successorship. She is the youngest among Alea, Apuesta, Dird, and Palty. Apuesa Da Ruma: She is the representative from the Da Ruma guild and currently 215th in line for the guild’s successorship. Palty Jurai: She is the 18 year old representative from the planet Jurai and currently 3399th in line for the imperial throne. She is the oldest among Alea, Apuesta, Dird, and Palty. What house she belongs to on Jurai (Masaki, Kamiki, etc.) has not yet been revealed, but the fact that she has “Jurai” at the end of her name means she should be partnered with a royal tree. Miron Pham: This person is the observer from Earth and the only doctor on the island. Minamida: He is the observer from the Galactic Alliance. Minamida is actually a pseudonym for YAMADA Seina from GXP. He walks around with four cabbits (D, F, M, K). These cabbits are believed to be either clones of Fuka from episode 24 of GXP or sub-Fukas (which I think is similar to the sub-Ryo-ohkis in TM!R). Shank, Balta, and Da Ruma? Weren’t those pirate guilds in GXP? Yes. I’m assuming these guilds are still pirate in nature, but until I get more information, I won’t say for sure. If you have any information about Paradise War you can share and provide a citation for, please let me know either on the blog portion of the FAQ (one of the comments), on Twitter, or on Facebook. Special thanks to Clyde “Tomato” Mandelin for taking time out of his very busy schedule to do some translation work done to get things started!